Shopping for a new car can be daunting, but there are ways to ease the sticker shock. It seems like new car prices always climb steadily upward, and the price of entry on even a base trim subcompact model gets steeper every year. But if you know where to look, like at our list of the top 10 least expensive cars, there are still some bargains to be found. There are some affordable cars out there, if only you know where to look. Inexpensive cars tend to fall into only a couple of categories, which, on the upside, will quickly help you narrow your focus. There’s a downside, of course, and it’s that low price cars tend to be small. Sometimes, they are very small. 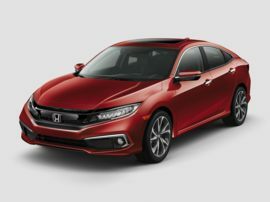 People who are shopping for bargain-priced new cars are probably prepared for these kinds of constraints, but the sheer Spartan qualities of most low cost cars can be a deterrent. It’s logical, though. Smaller cars simply have less room for the types of amenities that jack up sticker prices. Speed, comfort and luxury are not the objective. The focus of the least expensive cars on the market is to provide new car buyers with affordable, reasonably safe and rather efficient travel. That said, there can be some surprises when shopping for affordable compact cars and the even less expensive subcompacts. A lot of the safety features that used to be the exclusive domain of luxury and midsize cars have come down in price and are much more common than they used to be. If your budget has any wiggle room, keep an eye out for safety packages or other interesting options. If a low price is the highest priority on your quest for a new car, you’ve come to the right place. It can be done affordably, even shopping new.